Officer Chuck Cassidy’s family in Sea Isle in May, nearly a decade after he was murdered while interrupting a robbery in West Oak Lane. "Please, have some meatballs," Judy Cassidy says cheerfully as she rests an ivory-colored serving bowl on her tidy dining room table. It's a weekday night, and she's happy to have the whole family together: her 26-year-old son John; daughters Katie, 30; and Colby, 29; and 17-month-old granddaughter Charlie, who's a little fussy at the moment. Her daughters playfully needle Judy about not using paper plates for a change. Charlie totters to the living room, where she yells "Touchdown!" while watching Mulan for the umpteenth time. Everyone laughs. But Judy's smile fades as the conversation turns to the anniversary she's been dreading. Tuesday marks 10 years since her husband, Chuck, was gunned down when he walked into a Dunkin' Donuts on Broad Street near 66th Avenue as it was being held up by a pudgy robber named John "Jordan" Lewis. Cassidy, 54, had been a Philadelphia police officer for 25 years. He had never fired his gun in all those years as a patrol cop, and didn't get a chance to in the few seconds before he collapsed to the ground outside the doughnut shop. Lewis shot him once in the head, then crouched to steal Cassidy's service revolver before fleeing. The officer died the following morning. "Sometimes it feels like it was 100 years ago, because it's been so long since I've seen him," Judy says. "And yet just yesterday. … " Her voice catches, and she stops talking before the tears can take over. We're told from an early age that time will magically heal our worst heartaches, but anyone who has ever experienced a gut-wrenching loss knows it doesn't quite work that way. The Halloween murder of Officer Chuck Cassidy and the frenzied, multi-state hunt for his killer occupied the front pages of the Daily News and Inquirer for more than a week. Cassidy was one of 10 Philadelphia police officers who were killed in the line of duty between 2006 and 2015. "Right now is a tough time. This time of year is always hard," Judy said. "It never goes away." Chuck Cassidy was one of the 391 people murdered in Philadelphia in 2007, yet his death cast an outsize shadow over the city. He was the third police officer shot in a week and the second killed in the line of duty in as many years, a number that swelled to 10 by 2015. A round-the-clock manhunt was launched to track down his killer, and tips about Lewis' whereabouts poured in for several frenzied, frustrating days. A reward for his capture grew to $153,000 as investigators came to grips with the fact that he had slipped through their hands and escaped from the city. Cassidy was known throughout the sprawling 35th Police District — which encompasses Logan, Olney, Ogontz, West Oak Lane, and East Oak Lane — as a reassuring, approachable figure. Part of his daily routine revolved around checking on local businesses, which is what led him to the Dunkin' Donuts on Halloween morning. On another day, it might have gone differently. Cassidy grew up in Olney, went to Cardinal Dougherty High School, and deliberately spent most of his career in the area. He prided himself on being able to talk people out of turning small mistakes into bigger ones. "What made him so valuable was how he could relate with people," says Deputy Commissioner Joe Sullivan, whose friendship with Cassidy stretched back to their days as recruits at the police academy. "He didn't have that TV cop persona. He wasn't afraid to show a little empathy." "Honestly, I truly believe that when this a—hole robbed the Dunkin' Donuts the first time, if they'd called 911 right away, Chuck would've gotten him, and he would've been able to talk to him and turn him around," says Judy, 66. Officers and others pay their respects at Cassidy’s funeral. His badge number is in flowers. Instead, Judy buried her husband of 26 years on a chilly November morning, and Lewis was captured in Miami after a few days on the lam. He pleaded guilty to murder in 2009 and was sentenced to death by lethal injection, a fate that's been on hold since Gov. Wolf declared a moratorium on the death penalty in 2015. The Cassidys didn't get to grieve privately. Their tragedy played out in public — and political — arenas. Michael A. Nutter, elected mayor just a week after Cassidy was shot, invoked the fallen cop's name early in his administration when he needed to underscore his dedication to doing something about crime. There was always an event on the family's calendar — a mural dedication here, a plaque ceremony there — that required them to huddle together stoically while someone praised Chuck in kind but generic terms: the quiet, dedicated public servant. "I don't remember much. Some days, feels like it was all a blur," Katie says. "You spend most of your time trying to block it out. Then you go to one of those things, and it's like, 'Oh, this is why we're here.'" "It was awkward, trying to grieve with a camera in your face," John adds. Every now and then, it got weird. Cassidy's children were occasionally approached by seemingly well-meaning strangers who invented a connection. "People love being attached to a tragedy," Katie says, shaking her head. "They just wanted to be a part of it somehow, so they'd pretend like they were family." None of the tributes hinted at the father they knew, with the dry sense of humor only they understood. "He had his own language," Colby says. "You'd walk in the house, and he'd say, 'Hey, Fance. I sees ya, Fance.' He never called us by our real names. If we got home from school and asked, 'Where's Mom?' he'd always say, 'Fiji. The Fiji Islands.' This was before cellphones, so we really didn't know. He'd drive you crazy." 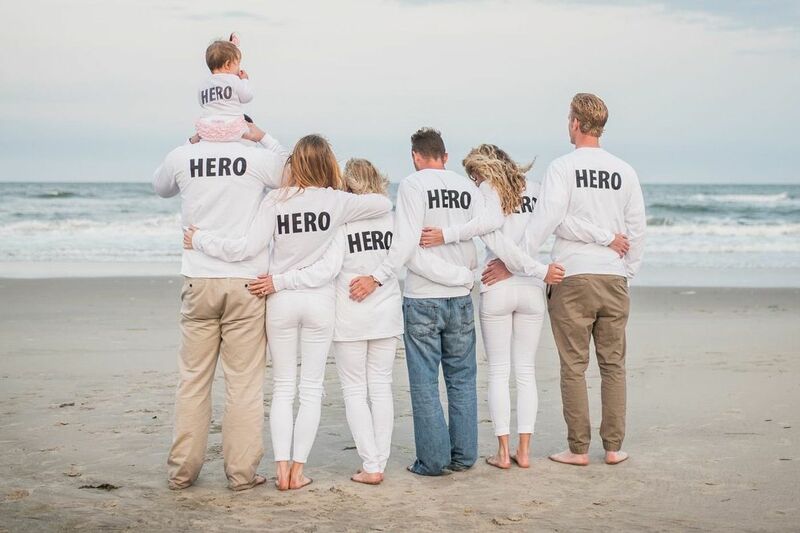 Officer Chuck Cassidy’s family in Sea Isle City, N.J. in May (from left): Colby Cassidy, holding her daughter Charlie; her mother, Judy; brother John, sister Katie. Cassidy's absence is felt in small moments like this, when everyone is sitting around and thinking about how long it's been since they've heard his voice, and big ones, like Colby giving birth to little Charlie in 2016, or Katie's planned wedding in November. Judy used to nudge her husband about cutting back at work, maybe even retiring. He relentlessly worked overtime, even if it meant missing out on trips down the Shore or dinners with other couples. Their final meal together was in their house in Northeast Philadelphia — meatballs and macaroni. There'd be time, they figured, for fancier dinners down the road. For now, there are more events for the Cassidys: an annual vigil Wednesday outside the Dunkin' Donuts, and maybe a graveside ceremony. Judy cringes every time she hears about a fatal shooting, each a reminder that another family is joining a club no one wants to belong to. She finds solace in the little things. Years ago, another cop gave her the uniform shirt and badge Chuck wore on the day he was murdered. Judy took tiny pieces of the blue shirt and put them in lockets for her daughters, and a wristband for her son. The rest she keeps in her room, above her bed. It feels a little like Chuck is still there, keeping an eye on everyone.